Hey everyone! How are you guys doing? This week is just flying by, isn't it?! Well, it is for me anyway! Today we've got a Blanquette de Boeuf. 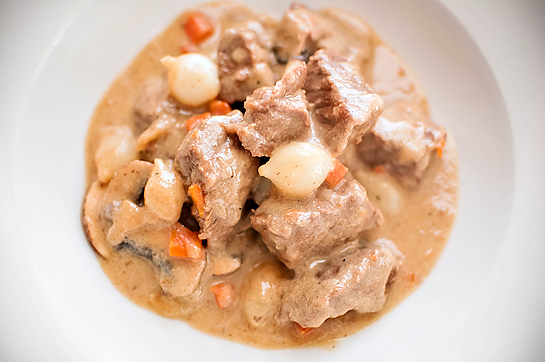 The name in and of itself is an oxymoron because a true blanquette (white stew) is made with a white meat, veal, or lamb. It's not usually traditionally made with beef. However, since beef is probably the cheapest out of veal or lamb, and I wasn't particularly in the mood for chicken, beef it was! 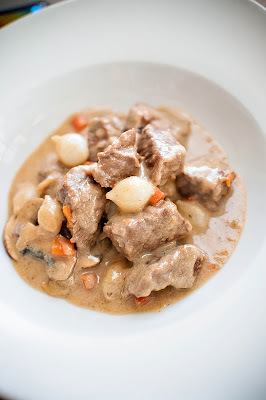 The main difference with a Blanquette is that the stew meat is blanched rather than sauteed. But just because we don't caramelize the meat beforehand doesn't mean this lacks in flavor! It really packs a flavor punch and you'll definitely want to try this for yourself! Start by trimming any excess fat or silver skin from your roast. 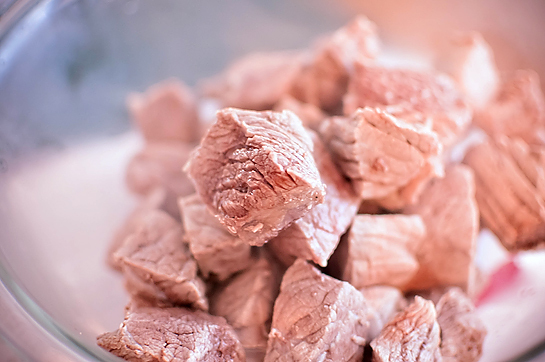 Then cut meat into 1 to 2 inch cubes. 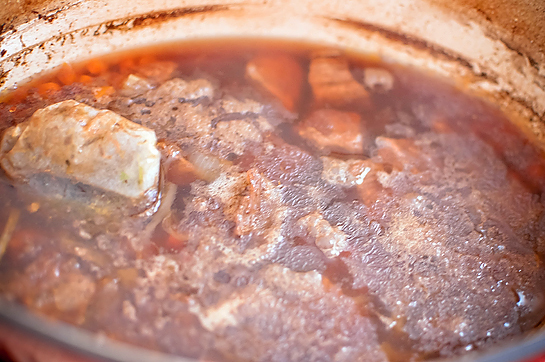 Place meat into a dutch oven or large soup pot and cover with cold water. Season with salt and bring to a rapid boil. As soon as the water is boiling, turn off heat and carefully drain the meat. Rinse to remove any impurities. Return meat to pot and add enough beef stock to cover. I had about 9 cups of stock before all of my meat was covered. Of course, this will vary from roast to roast (and how small or big you cubed your meat), so you don't have to strictly use 9 cups. Just enough to cover the meat. Place the parsley stems, thyme, bay leaf, and peppercorns into a cheesecloth (or coffee filter) and tie up tight. Place the bag in the pot along with your julienned onion, celery, and carrots. Season with salt and pepper, to taste. Simmer until the meat is tender, about 1 & 1/2 to 2 hours. Strain the meat from the stock, keeping and setting each aside. Discard the cheesecloth with spices. In the pot, add your butter and flour. 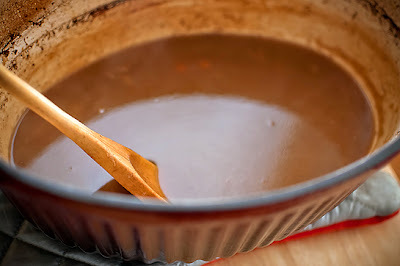 Make a blonde roux (about 3-4 minutes, until golden in color). Slowly add back in stock, whisking constantly. Bring mixture to a boil, then simmer for about 15 minutes, until slightly thickened. 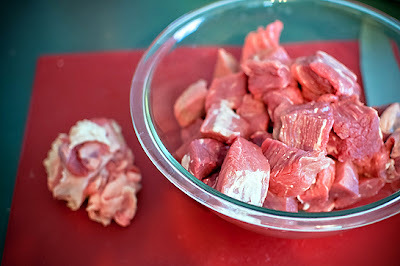 Now, if you just wanted regular beef stew, this would be your stopping point. 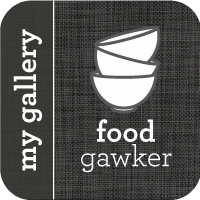 You've basically got your brown gravy and all you would have to do is add back in your meat. But we're gonna take it a step further and make this a little bit richer by adding the liaison of cream and egg yolk. Return meat to the thickened stock. In a small bowl, whisk together your egg yolk and cream. Make sure the soup pot is not at a boil, you want it to be at a slow simmer (under 135 F). If you're at a boil, you'll just curdle your eggs as you add them in. Slowly add a couple ladle-fulls of hot stock to the egg yolks, whisking constantly to prevent clumping. Once your egg yolks are tempered, add them to the soup pot. Stirring somewhat constantly, keep the mixture at a steady simmer. Heat a large saute pan to medium high heat and add about a tablespoon of butter. 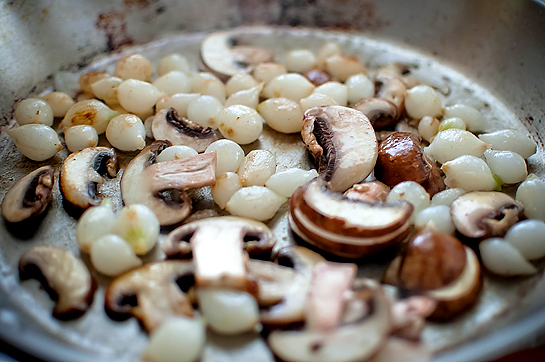 Add pearl onions and mushrooms. Saute until just softened, about 3-5 minutes. Add vegetables to soup pot. Finally, season the stew with lemon juice, nutmeg, and salt and pepper, to taste. Ladle into bowls and serve with a desired starch or all by it's lonesome. This was definitely a hearty and rich bowl of stew. Andy definitely loved it. The meat was tender, the gravy was out of this world good, and it was oh so filling! Give it a shot and let me know what you think! Have a great rest of the week guys! Looks so perfectly YummY,I love the color of the sauce with great spice ingredients,Yum !! I haven't tried blanching instead of sauteeing the protein in a stew - but, a quick review of these ingredients and I can certainly understand why it doesn't lack in flavor!! Yum. This dish looks so gooood! 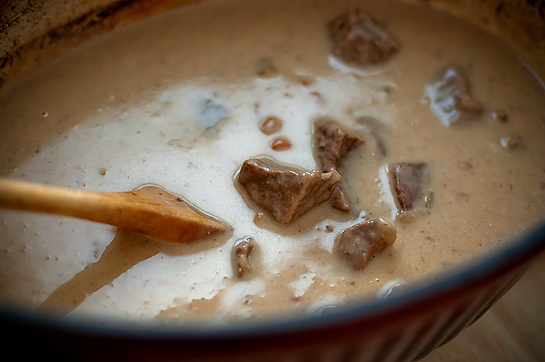 It's so cold here in the office that I wish I could get a plate of blanquette de boeuf.. beef.. yummmm! !